Hollywood has given the piranha a rough reputation as a vicious fish with a penchant for biting. But according to Sandie Millot, Pierre Vandewalle and Eric Parmentier from the University of Liège, Belgium, the piranha barks more than it bites. The team of biologists plunged a hydrophone (an underwater microphone) into a tank of captive red-bellied piranhas and listened in to the different sounds they make in different situations. So far, the team registered three distinct noises. When piranhas enter into a confrontation they’ll make a barking noise. 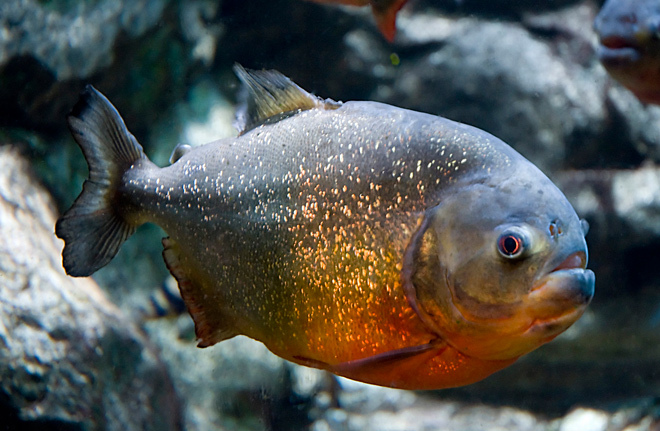 When they’re fighting for food or circling an opponent, a piranha will make short percussive drum-like sounds. And when their jaws snap at each other, a softer croaking sound is produced. They might make a noise when they’re being amorous piranhas, too, but the team would have to travel to Brazil to answer that question. “It is difficult for the fish to reproduce in the tank,” according to Parmentier. Convinced that the fish had a wider acoustic repertoire than they had initially thought, the team looked into how the fish produce the sounds. Piranhas produce sounds by contracting muscles which vibrate their swim bladders — internal organs that regulate buoyancy. But once those muscles are no longer contracted, the sound stopped. This means that the muscles were driving the swim bladder’s vibration directly, and not through the bladder’s own intrinsic resonant properties. During the study, which was published in The Journal of Experimental Biology, the team found that the piranhas deserve their fearsome reputation. “We both visited the hospital because we were bitten and Sandie’s finger was nearly cut in half,” recalls Parmentier. You can hear the three sounds in the video below, courtesy of National Geographic.